Poll results: Do you use the 4K video recording mode on your iPhone 6s or 6s Plus? With the iPhone 6s and its larger sibling the 6s Plus, Apple made its first foray in the 4K video recording universe that Android handsets have been inhabiting for a while now. As usually happens when Apple considers a technology mature enough to offer it on its handsets, the 4K video shot with the new iPhones is well-executed, with a great amount of detail, jolly colors, extremely rapid exposure adjustment, and zippy continuous autofocus. In short, you can't ask much more from the 4K video quality from the iPhone 6s and 6s Plus, as a recent impromptu test against a Nikon DSLR revealed. The new iPhones, however, start you off with 16 GB of internal storage for the basic version, which can get filled with your 4K footage pretty quickly (a minute of it is about 400 MB), plus there is the issue of downloading and previewing it on your monitor or TV that are still waiting for you to swap them with 4K editions. You get more defined footage, of course, even if you preview the 4K video shot with the new iPhones on an HD screen only, that's why we wanted to ask you if you are using the 4K video recording mode on your iPhone 6s or 6s Plus at all, and how often. It's not by accident, after all, that Apple tucked the 4K option in the settings app, rather than providing a way to switch to 4K recording directly in the camera interface. Well, it turns out that the overwhelming majority of our respondents don't shoot in 4K, or only rarely fire up that option, which can be expected given the storage footprint a 4K video can leave, especially if you have the most affordable 16 GB models. Do you use the 4K video recording mode on your iPhone 6s or 6s Plus? 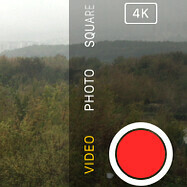 4K recording on iphones are a joke! I did one, just to see how it looks. It takes up way too much storage, and simply isn't needed. 720p will do just fine for everyday recording. Because tvs and laptops/pcs are 1080p nowadays? Well I choose to record at 720p? I use 720p too, it's a good compromise between quality and size. "especially if you have the most affordable "16 GB" models"
That's why you need a micro sd cardhttp://www.phonearena.com/news/Deal-Snag-a-high-performance-128-GB-microSD-card-for-70-on-Amazon_id74647 My Z3 records in 4k and stores it on my Samsung class 10 card. It also uploads to Photos for free. I wonder why PA never did these polls for other phones when they did 4k a couple years ago. Note 3 anyone? Where's the "No, I don't have Iphone 6s" option? how many mins can it record 4k video before shutting down. How come all these reviewers when it comes to the iphone are silent on this? But when it comes to other phones they are quick to point out its disabilities. They are quick to point it out because other phones actually have time limits. The iPhone 6S/6S Plus don't have a time limit on 4K video recording. It's does. The time limit is when it gets too hot to record anymore. Which I would say is probably 10 mins at most. Oh, nice, guessing passes for knowledge now? That's hilarious, but wrong. I'm at 15 minutes, and counting, on my 6S Plus, and the handset is barely warm. You must be thinking of phones with cheap, OTS components. BTW, I got bored after 25 minutes and 10+ GB of video, but it was still just warm (with other things working in the background, no less). It's neat that it can. But I would choose 720p too. I would choose 1080 at 60fps. I used 4K recording while on vacation. At the time I had a 128GB S6 Edge. I just wanted to basically make my trip videos as awesome as possible. I usually just use the default which is 1080p. This is EXACTLY the same use case scenario as me. But with the iPhone making waves about their 4K recording, I might just start doing more recording in 4K now using my Android device. It sure looks hella crisp, even though I'm more focused on frame rate plus stabilisation than resolution. No, its nice to have I guess but I use 1080p 60fps for the rare occasion I record something.